Like many astronomically minded folks, I traveled with the family to see Monday’s total solar eclipse. Though there were some high thin cirrus, the view from Casper, Wyoming, was incredible and I really can’t wait till 2024 when totality will be twice as long. I didn’t spend too much time taking pictures and took no pictures during totality. Maybe next time I’ll give imaging a try. The most striking thing about totality is how 99.99% of the pictures out there don’t come close to showing what totality really looks like to the human eye. The picture linked “here” comes closest to portraying what totality looks like in person for the 2017 eclipse. The color, relative brightness and structure in the corona is a match to the eye’s view. Though the star Regulus (to the lower left) wasn’t visible to the naked eye it was easy to see in 10x50s. Back to meteors, for the week I was in Wyoming the meteor camera was off. The Perseids are now fading into the background though we are starting to see our first Orionids which will build to a peak in mid-October. 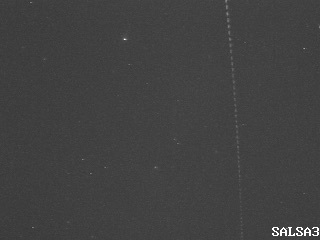 The featured image is of a long-lived meteor that crossed the entire camera FOV last night at 03:50 UT.